Ever since I started my no-disposable-plastic policy, one of the first victims was cling-film. At first, I thought it was going to be hard to find a replacement, but it ended up being really quite easy! Even better, since I design my own cloth it allowed me to be a bit more creative with the project. 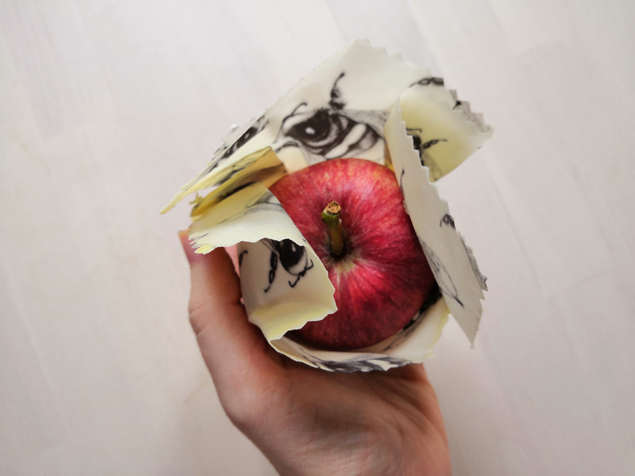 But if you’re not a DIY type of person you can just buy a Bee’s Wrap. 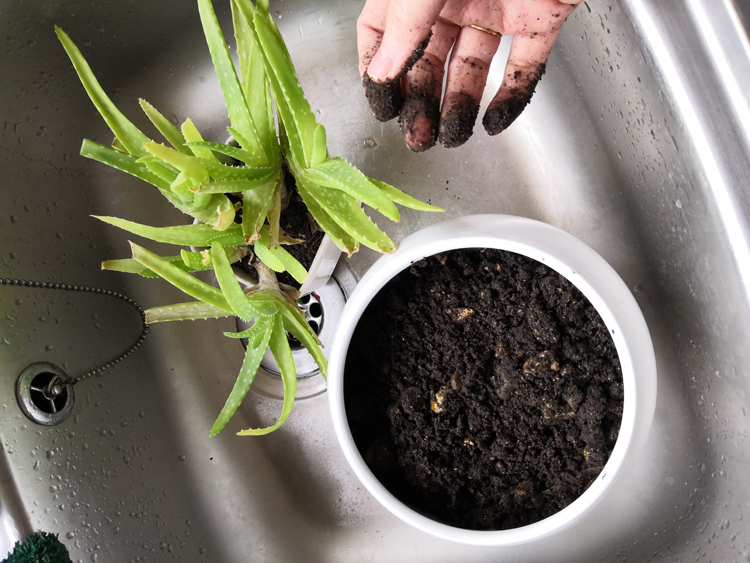 These normally last 3-6 months, or to a year – depending on how much you use it – and once they’ve become loose and floppy you can either re-wax them or just throw them in the compost pile. Wrap it over or around whatever you want to be covered and hold it in place for a few seconds. The heat from your hands will mold the cloth into the shape you want it to take, and stay there till I want to take it off. The same for loose fruits, vegetables, fresh bread and anything else you would normally keep protected in cling film. Just wrap it, hold it in place for a few seconds you’re done. You need to start off with a piece of material. I would recommend that you have a few different sizes, some small pieces, some medium sized and a few large. 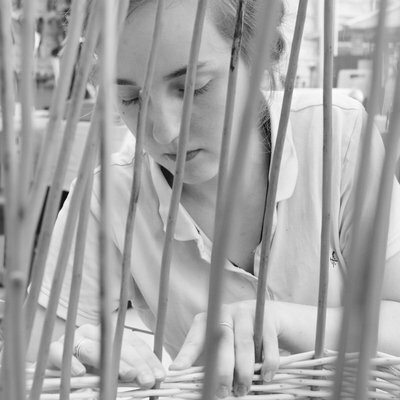 Avoid using a material which is very stretchy as it will deform quite quickly. Cotton, hemp or linen is your best bet. This part is optional, but I like to go around the edges of the cloth I’m using with some pinking shears so that the edges are less likely to fray. To be fair, I’ve found that once it’s cased in beeswax the edges don’t tend to fray much anyway, but I prefer the look, and the slightly neater edges when I do it this way. 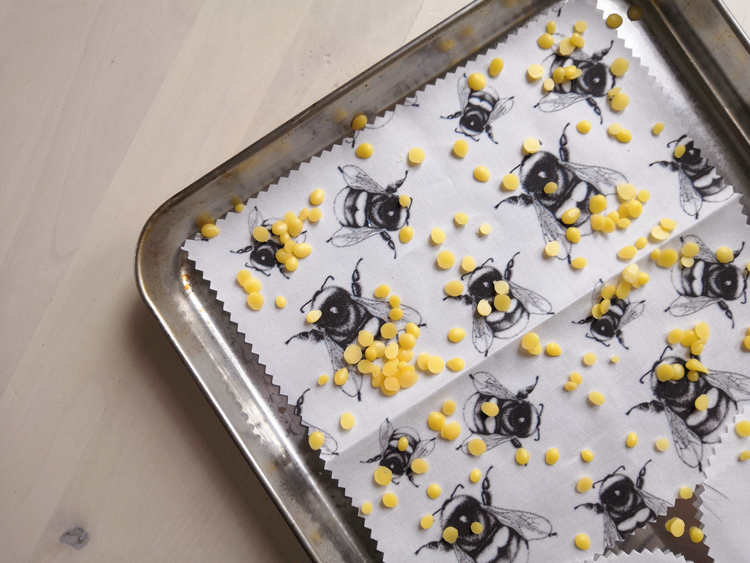 Now take your tray, place the cloth on it, and if you have beeswax pellets, sprinkle them over the cloth. If you just have blocks of beeswax then get your cheese grater and cover the cloth in shavings. Once you’ve covered the surface of your cloth in enough beeswax, stick it in the oven till the wax has melted and spread over the cloth. 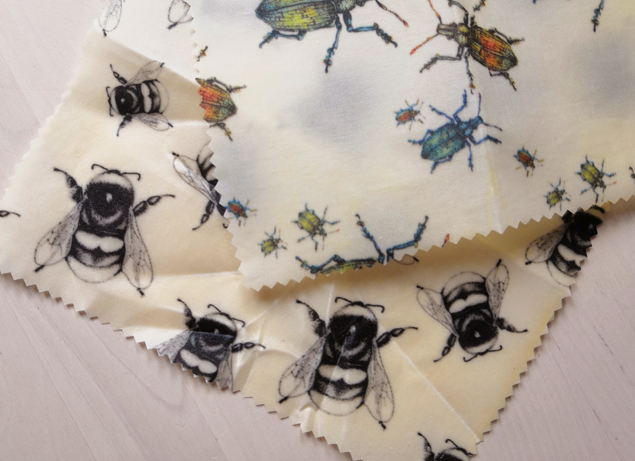 When the beeswax has melted, quickly take it out of the oven and hold the cloth up by the corners so that it dries with the cloth roughly flat. I normally use a fork to lift up the edges. If you think you missed a few areas put the cloth back on the tray, grate more beeswax over the areas you missed, put it back in the oven till melted, and take it out again to cool. What If My Cloth Is Bigger Than The Tray? Just fold the cloth so that it fits in the tray, and cover it in a little more beeswax than you would have had it been a single layer. 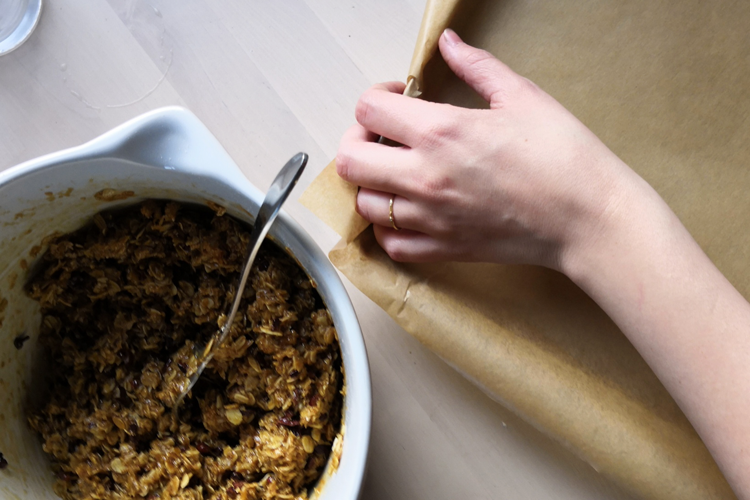 Give the wrap a quick clean with soap under cold water once it needs a wash. You can use lukewarm water to clean it if you want, but it’s better to stick to cold water. The more heat the beeswax is exposed to the faster it will lose its stiffness. Disclaimer: Items linked on Amazon are affiliate links. A few months ago we realized that we’d downsized so much that we didn’t really need our bedside tables, and in fact, they were more of a nuisance than anything else. My main issuse was that they blocked the storage drawers under the bed, and dust bunnies loved to collect under them. As someone who really doesn’t do well with dust or dirt, that was the last straw. 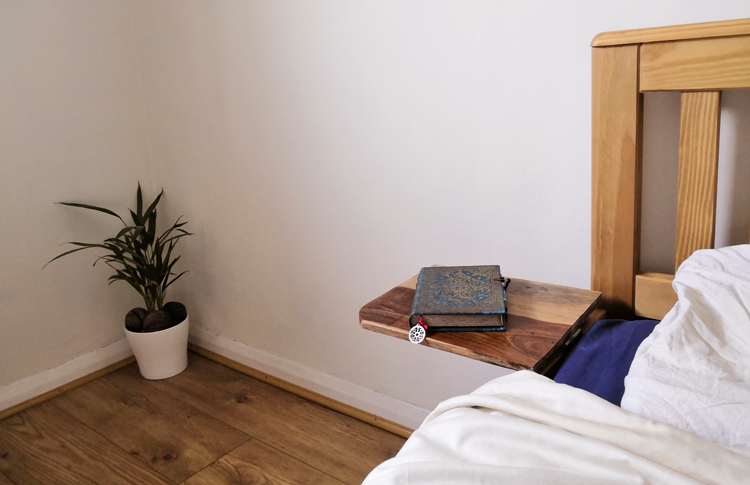 But we still needed some kind of bedside table, just enough space to hold a book or an alarm clock, so I decided to make one. 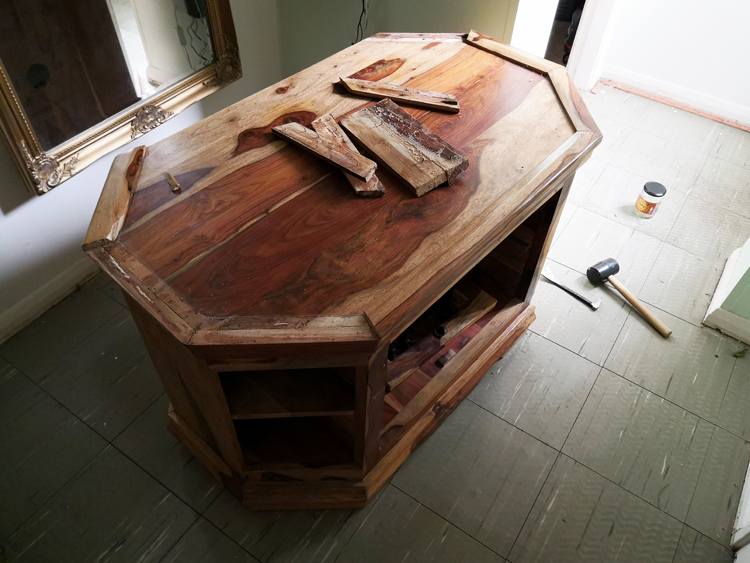 I’d found a broken up Sheesham wood tv unit on facebook marketplace recently, and even though I ended stabbing myself more than once, I took the whole thing apart to use the lumber for various house projects. The first thing I used it for was a few shelves and then the floating bedside tables. Then the only other thing I needed were brackets and some screws. The brackets I found in the sale section of aldi (£1.99) and the screws we already had. So other than the time, building both these bedside tables cost me less than £3, and the floating bedside tables I had been looking at cost £21.99 each. Maybe it’s just because I’m a complete sucker for a bargain, but I absolutely love how these turned out! 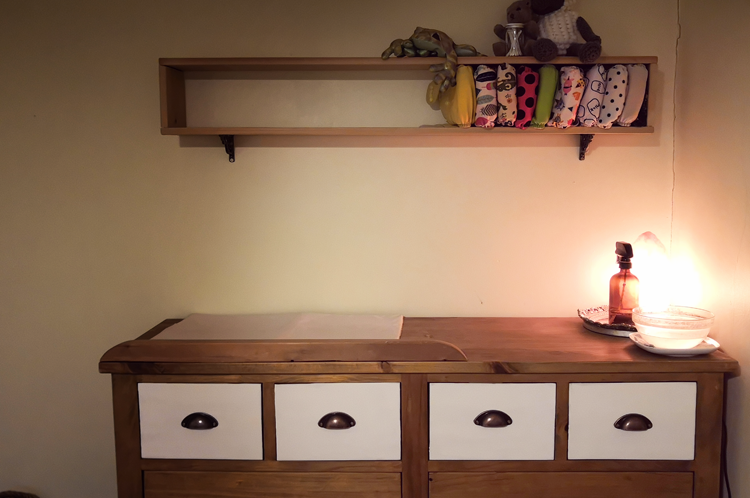 This is one of those projects which has been on my list pretty much since we moved into our house six months ago, and last week I finally got it done – mostly. The nappy shelf was my main priority. Having to stuff the nappies we had into the two small top drawers was just not a very good system. It was far too easy to run out of nappies and not realize it, plus, I’d spent a good amount of time selecting nappies with weird and wonderful patterns on them. I didn’t want them stuffed away in a drawer. If you want to make something similar but don’t think you could make a cube shelf another alternative is to buy a CD tower, or use towers like this and mount it on some brackets. There’s not much more to add to this post other than sharing the video, so I hope you enjoy! A few months ago I wrote a post showing how I make my eggshell exfoliating powder and today I thought I would follow it up with a balm I love to make. 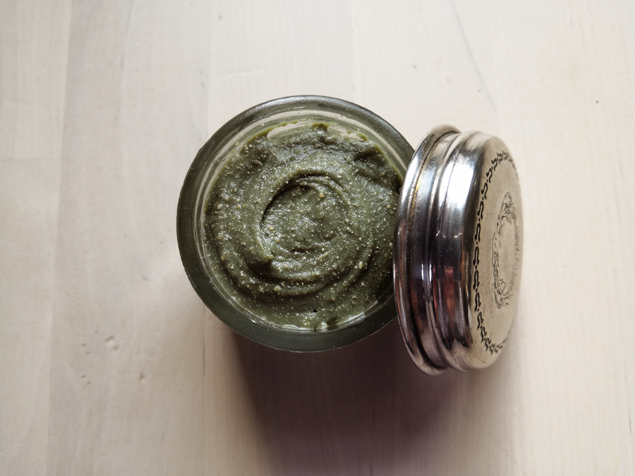 This cleansing/exfoliating balm has gone through a few different versions using different oils and butters, but the main mix of oil, butter, clay and exfoliating powder has stayed the same. 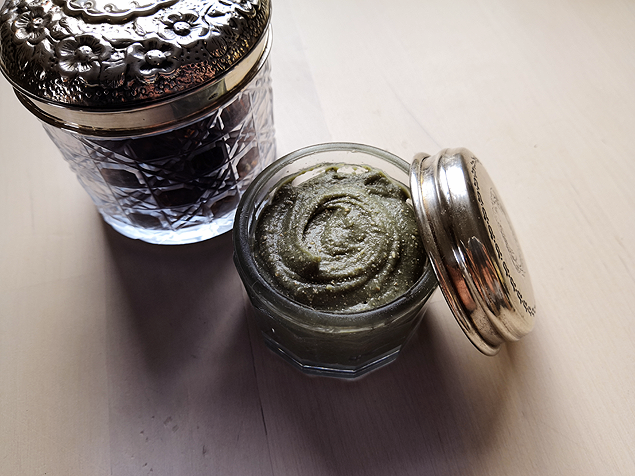 Whatever the size of the jar or pot you want to use, divide that up into four portions and make the mix above with any face oils or butters you want to use. My go-to oils for this recipe tend to be a mix of rosehip, jojoba, evening primrose oil and vitamin e oil. As for the butter, so far I’ve tried hemp oil and mango butter, but don’t think that you have to use exactly what I use. It’s not the type that matters, it’s the consistency. That thick heavy butter is what stops the exfoliating powder and green clay from just sinking to the bottom of the pot and being an oily nightmare to apply. Once you melt it down and mix it in with the other ingredients it holds them all together beautifully and gives you an even amount of all the ingredients. If you don’t have green clay then feel free to use other alternatives like bentonite clay, rhassoul clay, pink clay – you get my point. Any skincare clay. 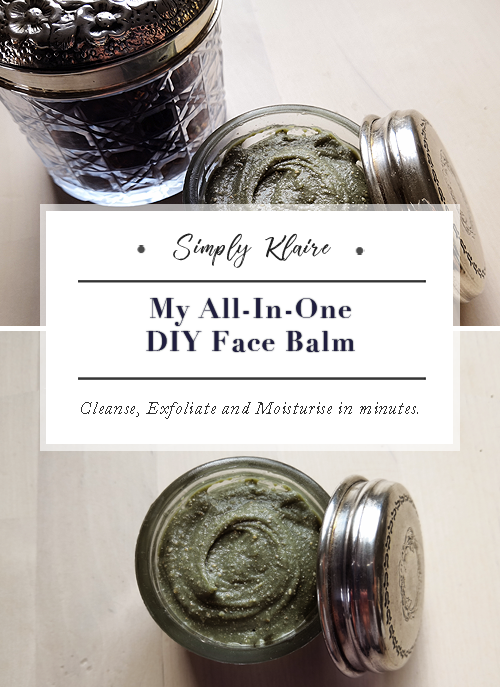 Once or twice a week I’ll use this balm to clean, exfoliate and moisturize my skin. A few minutes massaging, another fifteen minutes sinking in and once minute wiping it all off with a warm wet towel. My skin feels so soft each time, and I love that I can get everything I want – cleaning, exfoliating and moisturising – in one quick go. No messing around with multiple balms, oils and products. Quick, simple and effective. A sad as it sounds, cleaning has become something I quite enjoy. Once I started to make my own products and stopped using the regular house cleaning products that really, really didn’t agree with me, I started to enjoy the whole process. 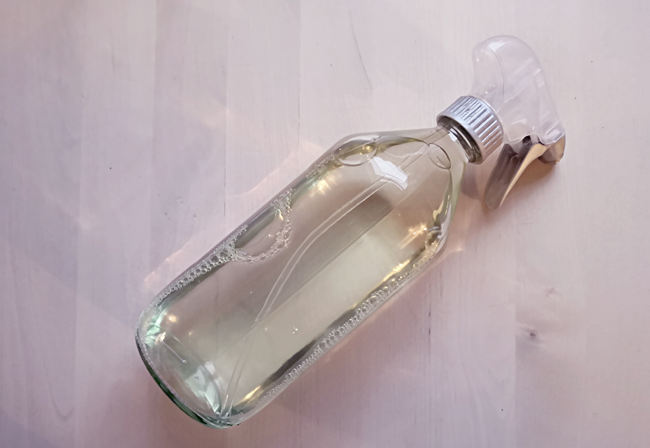 I especially love having everything in glass spray bottles, it just looks beautiful! 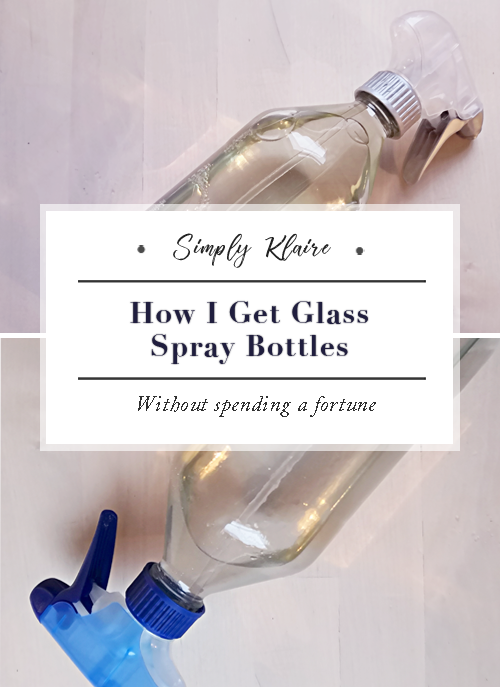 A few years ago and I’d bought one glass spray bottle but never bought another since simply because I was squirreling every. spare. penny. into my savings – buying a house is expensive! Spending £12 on a glass spray bottle wasn’t something I was about to do. It was only about 6 months ago that I noticed that the glass distilled vinegar bottles I’d seen in Tescos happened to fit perfectly with the nozzles of most regular house cleaning products perfectly. I didn’t have to buy any new plastic and I could use most of a finished product which would otherwise just get thrown away. My family still use regular house cleaning products, so once they were finished with one or two bottles, I was able to take those and repurpose them. It’s not just this brand of vinegar bottles which work. The bottle top width is a pretty standard size, so if you keep an eye out you’ll find that a lot of other brands that work. If you don’t buy standard house cleaning products maybe ask friends and family to save you a used up bottle? You can buy the spray tops on their own, but so far I’ve found it’s more expensive and the pump power is a lot weaker than in the normal house cleaning products. What Do You Use The Bottles For? 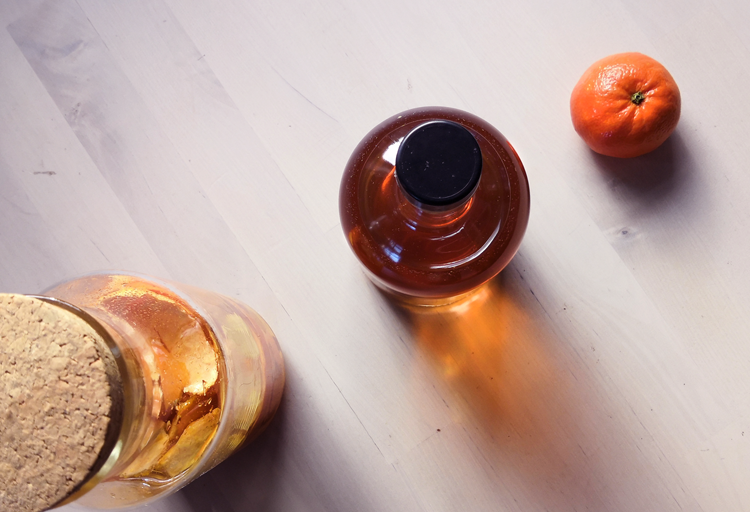 The grey bottle for cleaning any countertops or floor tiles. A small teaspoon of regular washing up liquid, water, 5 drops of peppermint essential oil and 10 drops of tea tree essential oil. The peppermint smells great to me but smells awful to spiders, which is fine by me, anything which keeps them out of the house! Tea tree is a natural antibacterial, antiviral, fungicidal and a parasiticide. Exactly the kind of thing I want to kill any nasties on the kitchen surfaces and floor. The blue bottle for laundry, dusting or a quick spot clean. This one is just water – hence the blue spray top – makes cleaning stains out of any clothes much quicker and easier too. A vanish bar, a quick spray to wet the area and a quick scrub. The green bottle for cleaning stainless steel and windows. 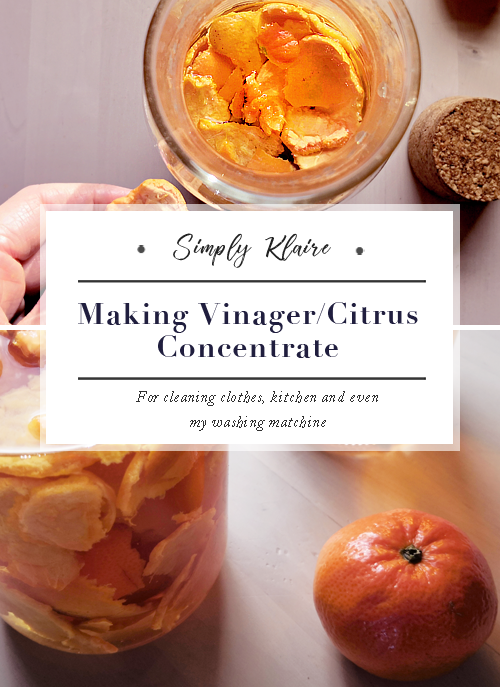 A 50/50 mixture of citrus distilled vinegar and water. This is the one that’s made the biggest difference to me. The regular stuff I used to use would make my head spin hours after I used it, not to mention if I accidentally got any on my self my skin would crack open and bleed. Hurt like hell. This mix works much better for me. 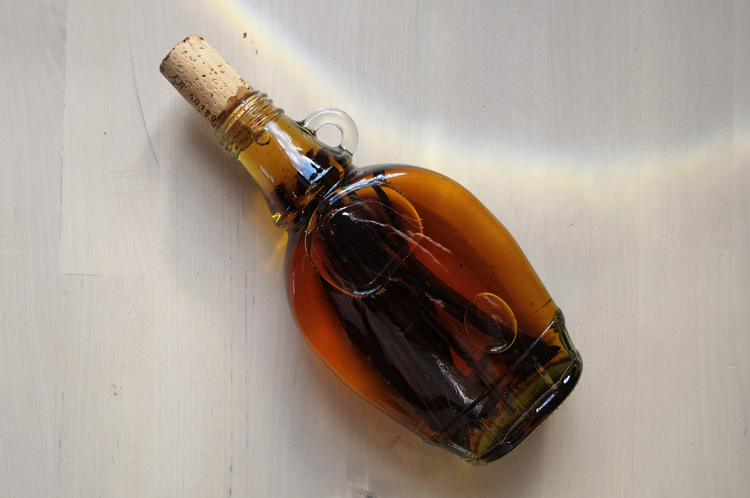 This is quite possibly the easiest instructional blog post in the world, but when I last posted on Instagram about my homemade vanilla extract, I had a lot of people asking me how to make it. Hopefully, you’ll forgive me for making such an unbelivably easy tutorial, but maybe you didn’t realize just how easy it was? If that’s the case, well, you’re going to enjoy this. First things first, cut the ends of the pods off and then slice the pods in two down the middle. Sometimes I cut them into fourths, but it’s not necessary. If you want you can skip this step entirely, but it takes a lot more time for the vodka to become vanilla extract, which is why I prefer cutting the pods in fourths. Take your bottle, fill it halfway with vodka, put the sliced vanilla pods in, fill the rest of the bottle with vodka, close the lid and that’s it! If you want you can give it a shake once a day to get the process going a little faster, but you barely even need to do that. Normally I just make a batch once the first bottle is roughly halfway finished and leave it in the back of the cupboard till I need it. If you don’t want to buy a bottle just for this you can just take the vodka bottle and put the pods in there with the vodka. If you want a mint or citrus flavor to your vanilla extract add mint leaves or citrus zest in with the vodka too. 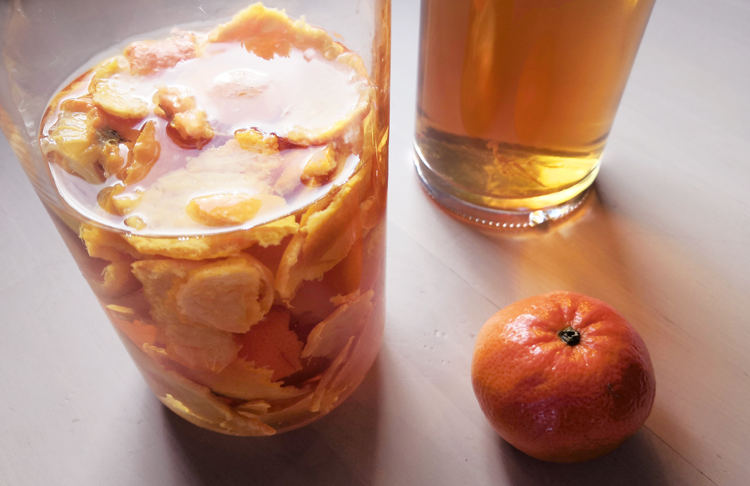 One small thing to note here is that you need to make sure that neither the mint or the citrus fruit have been sprayed with pesticides, of they’ll end up mixing in with your lovely homemade vanilla extract. Kinda defeats the purpose really. 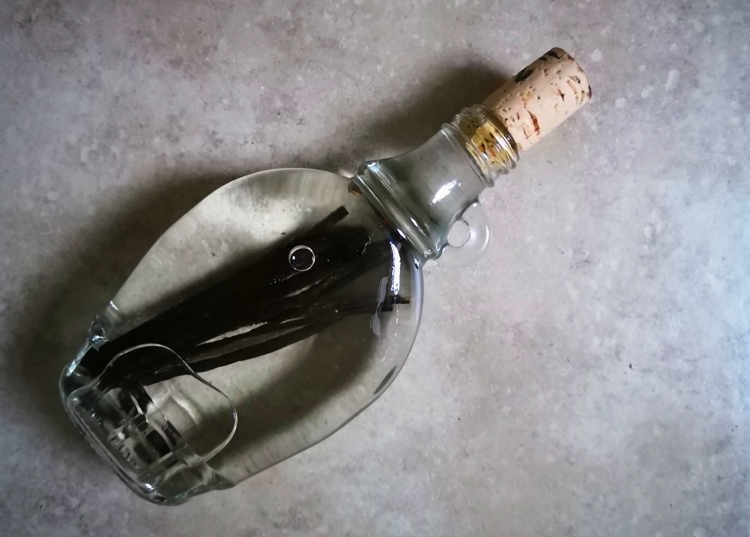 Sometimes, if I’m just using one bottle for making vanilla extract, I’ll add two fresh vanilla pods every couple of months and re-fill the bottle with vodka if it’s getting low. Then I’ll just go right ahead and use it if I need to. It’ll be slightly weaker at first, but after a week or two it’ll be up to the same strength as before. Since I use vanilla extract as a treat (those pods are expensive!) this works perfectly for me. But if you like to regularly use vanilla extract then I suggest you have two bottles, one to use and one to mature in the meantime. 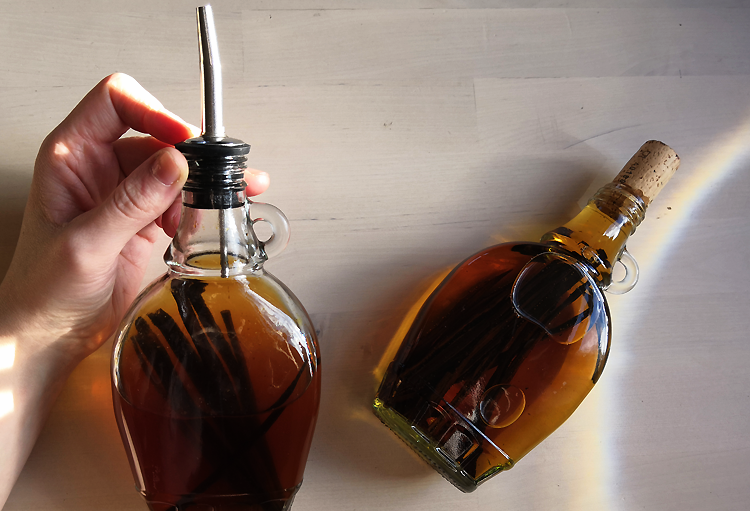 I like to add an oil pourer to the vanilla extract bottle. It makes it so much easier to pour the amount I want, not to mention it’s faster and doesn’t leak everwhere. The old bottle I used to use would spill everywhere and it drove me nuts! Btw, that link above is an affiliate link. 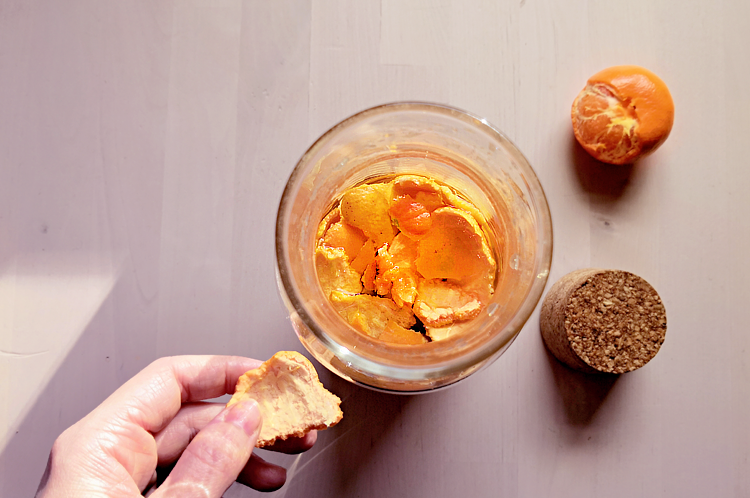 You don’t need expensive vodka. Of course, you can if you want to, but I’ve never noticed a difference in taste. And that’s it! Easy, isn’t it. When I was little one of the things my mum always made sure we had in the car were two large knitted blankets my Abuela had made, some travel sweets and a car first aid kit. Ever since I got married in 2017 I’d been planning to put together my own car-first aid kit for my husband’s car. Something streamlined, with all the basics covered, but also with anything we might need in case one of us has an accident with an ax, or a chainsaw. We have a wood burning stove for heating the house, no central heating, so a serious accident when cutting wood is a very real possibility. With that in mind, I put together this small kit and thought I would share it with you. 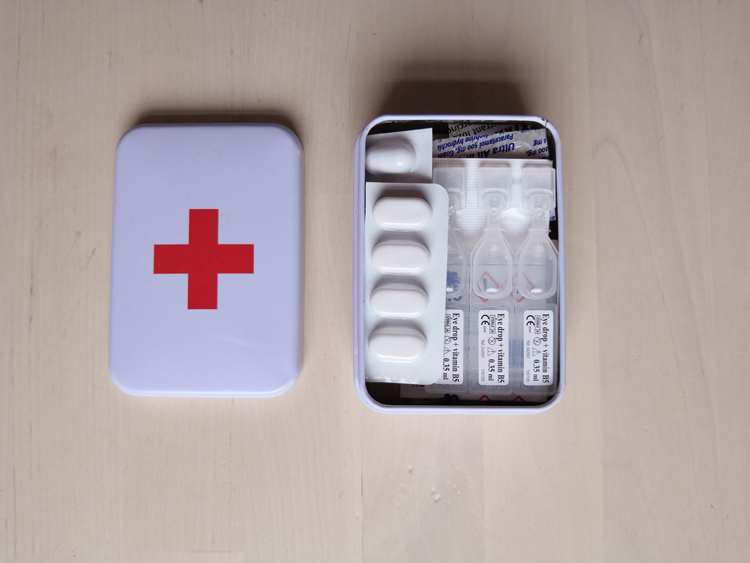 I have two boxes for this; a larger tin box for the big items such as the bandages and Israeli bandage, and a smaller tin for the items which would rattle around and drive me nuts. 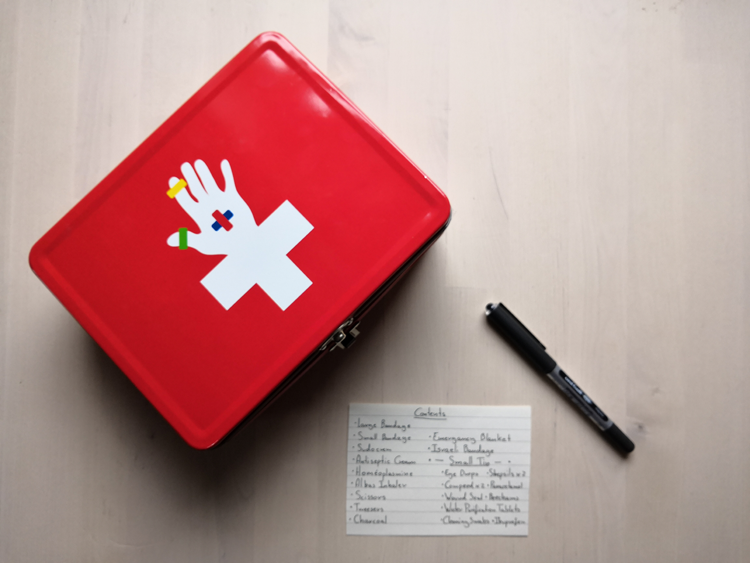 At some point, I’m probably going to add some travel sweets in the car too – but I don’t want them in the glove compartment or anywhere near the first aid kit. While potato is still quite small, he won’t be small for long, and I don’t want the first aid kit to look like a treat tin. It’s also the reason I don’t have a full packet of ibuprofen or paracetamol in the kit. It might sound a little paranoid, but I’d rather be safe than sorry. There’s just enough in there for a day, maybe two if needed, but not enough to send a little one to the hospital because they got hit with a case of the curious munchies. I bought the large tin in Tiger a few years ago, and the smaller tin had originally been bought for keeping Potato’s nappy cream in it. When that didn’t work I figured I’d save it for the car first aid kit. 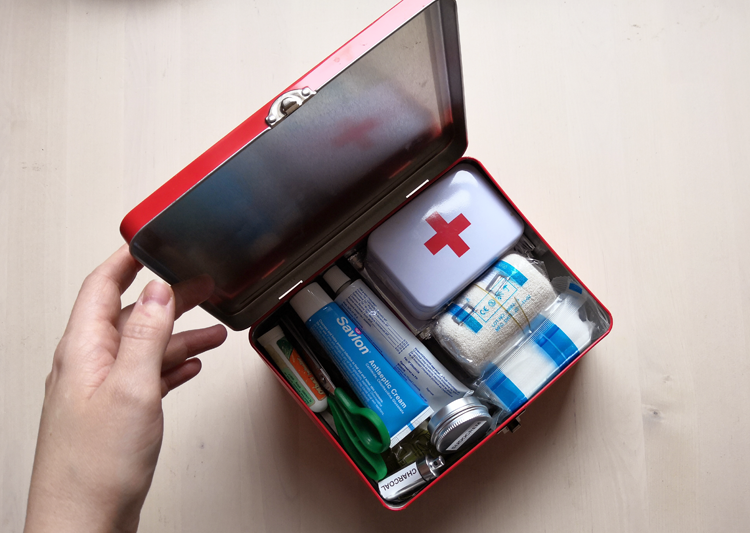 I wanted it to be obvious and visible to anyone who urgently needs the kit what it is they’re looking for, and you can’t get much more obvious than a bright red tin with the first aid cross on the top. I also added a list of contents to the inside of the large tin lid, which might be slight overkill, but it was a detail I think will help keep it semi-organized. Finger’s crossed. Emergency Blanket: Good for cold and protection from the heat. I’ve seen some families use it as a curtain on their car window too when they’ve had to travel for long periods in hot weather. It’s a little bit of a DIY botch job to use it like this, but when it’s hotter than hell in the car and you have a sunburnt crying child in the seat behind you, making the car look like a small spaceship is a small price to pay. 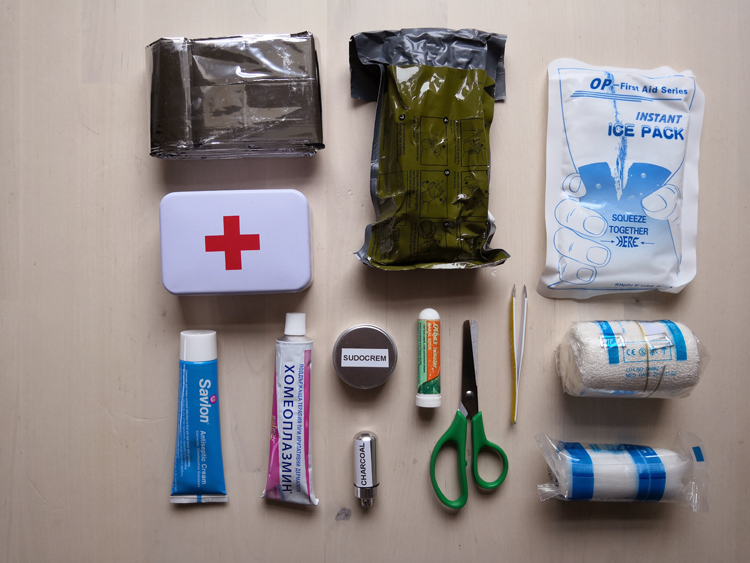 Emergency Bandage/Israeli Bandage: Designed to stop hemorrhagic wounds, this was the first thing I put aside for the car first aid kit. The main reason I want this is in case myself or my husband has an accident with the chainsaw. It’s unlikely to be needed, but if it is needed, it will quite literally save a life. Instant Ice Pack: Self-explanatory really. Also great if you’re unlucky enough to get sunstroke. Savlon Antiseptic Cream: It’s cream, it’s antiseptic. Homeoplamine: This is a cream my mum always had in the car, and my God, it’s amazing! When I had my photo taken by Rankin a few years ago the makeup artist on the set was using this for lip balm and gloss, and it reminded me how much of a great product it is. I use it for scuffs, rough dry skin and chapped lips which are one painful smile away from splitting open. It’s basically your nuclear option moisturizer. Sudocrem (Depotted): I’m yet to find Sudocrem in a pot that isn’t huge, so I de-potted it into a smaller tin and labeled it. Great for nappy rash, sunburn, emerging zits, insect bites and sometimes eczema. I say sometimes for eczema because I know quite a few people who suffer from it and were sensitive to Sudocrem. Charcoal Tablets: I keep this in a small travel pill tube which fits about 5 tablets in it. This is a must for me. A few years ago when I bothered to go out for drinks I would always end up being the designated sober friend – yes, it was annoying. Quite a few times those friends just couldn’t help themselves and drank way more than they should. That’s when the charcoal tablet came out, because if they want to hug the toilet in the pub, fine, they can do that, but I’m not scrubbing their vomit off my carpets at 3am. It’s the absolute bomb if you get food poisoning, and potentially lifesaving if you (or a little one) has eaten/swallowed something poisonous. Olbas Oil Inhaler: When your nose or sinuses are completely blocked up this little inhaler is incredible for unblocking them. Sometimes it’s only a very temporary unblocking, but I’ve never regretted carrying it around when I have even a mild cold. Scissors: Good for cutting bandages to size, cutting threads off clothes, fixing up the stray ends you’ve just noticed (yup, I’ve done that) and a tone of little things that you won’t even think of until you need it. Tweezers: When I was little my siblings and I seemed to get splinters. All. The Time! Especially if we were on holiday or away from home. Once I was a little older I ended up being the designated splinter remover because I had a knack for getting them out. That habit has stuck with me, so I always keep a good pair of tweezers on me. Oh, and they’re also good for a quick last minute tidy up of your eyebrows when you’re in the car. Large Bandage: For big problems. Small Bandage: For little problems. 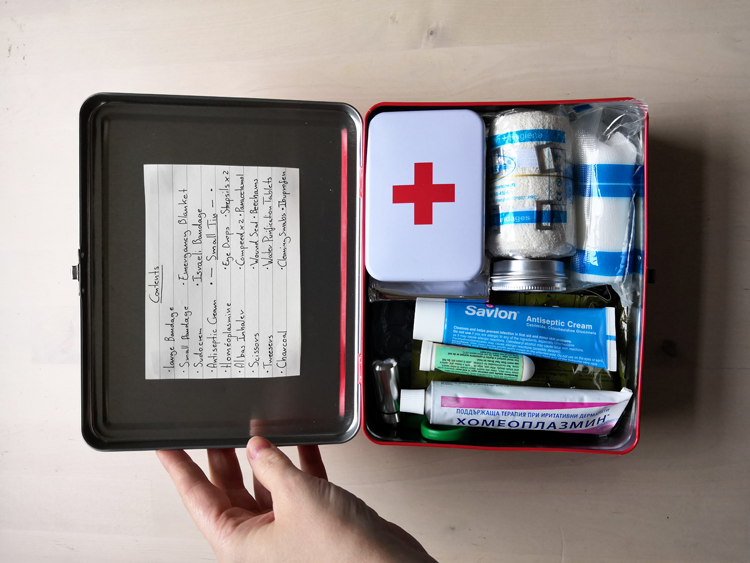 Small First Aid Tin: All the little bit’s and bobs that will get lost or destroyed if left loose. 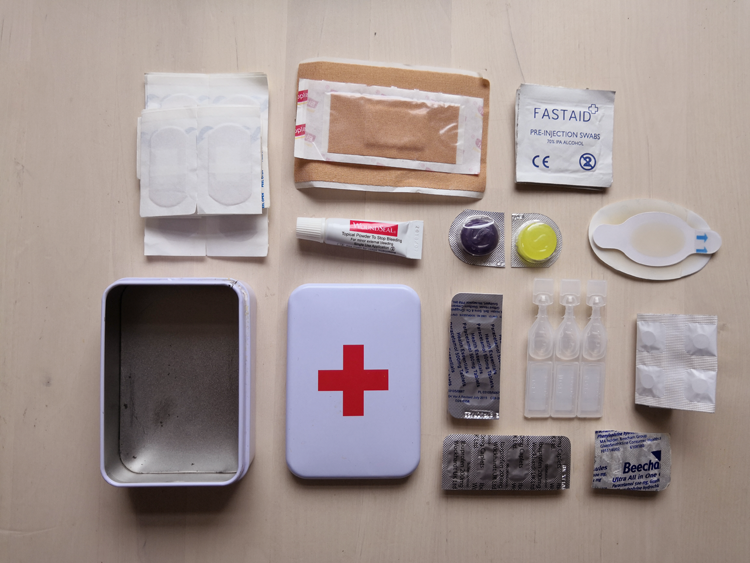 Plasters: A collection of a few large, medium and small plasters. All fabric and none of those useless waterproof ones which always seem to congregate at the bottom of swimming pools. Disinfecting Wipes: I did consider having hand sanitizer in here, but since I always have a bottle of the stuff in the baby bag and the bottle would take over most of the first aid kit, I opted for the wipes instead. Woundseal Powder: Designed to make blood clot and create a scab/seal. Another must-have on my list in case of a serious accident, or just a cut that won’t stop bleeding. Strepsils Sore Throat Lozenges (in honey and berry flavor): A favorite of my husbands and utterly indispensable if either of us gets a flue/cold. Two Compeed Plasters: I had a small box of these when I walked the Santiago a few years ago, and as far as I’m concerned these are essential. I can handle the flue from hell, but an evil blister will take me down like a bulldozer. Four Paracetamol Pills: These are mostly for me as I’m mildly allergic to Ibuprofen. Three Eyewash Pods: I’ve seen kids calm down faster from nasty cuts and bruises than from a dirtball to the eyes. They don’t take up much space in the kit and they’re worth their weight in gold. Water Purification tablets: This one is just a camping habit which I might eventually drop, but for the moment it doesn’t hurt to have them in there, and it makes me feel better knowing I have them. Four Ibuprofen Tablets: Mainly for anyone else who might need pain relief, or for me if the pain get’s too much and I’m willing to swell up like a balloon to make it stop. Beecham’s all-in-one: Great for pain, congestion, chesty cough, flue and colds. The last thing I did was write out what exactly was in the kit and which tin it was in. This might be a complete waste of time, but even if it gets completely ignored it still gives me a list of what I kept stocked inside in case I forget. I have one or two items I might remove or try to use up at some point, like the Beechams all-in-one, or maybe even the water purification tablets. But for the moment I want to leave it in the car for at least a year before I go through it again and re-refine it. One item I might add is topical pain relief, but for the moment I’m quite happy with the kit. Disclaimer: The links provided are affiliate links. 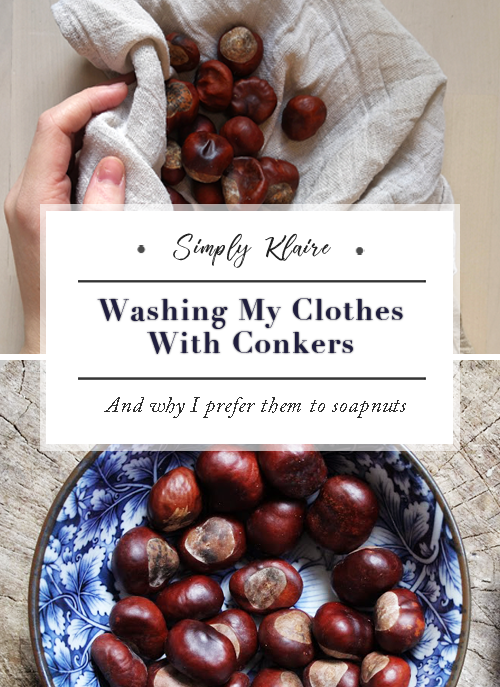 Last year one of my goals was to try and make the switch to using Conkers – aka, horse chestnuts – instead of soap nuts for laundry detergent. Not everyone has heard of sopanuts, so I think I should explain what those are first. They look like redish-brown sticky nut shells, and the shells contain saponins, which are what wash your clothes and create the soapy froth you see when you clean your hands with a bar of soap. 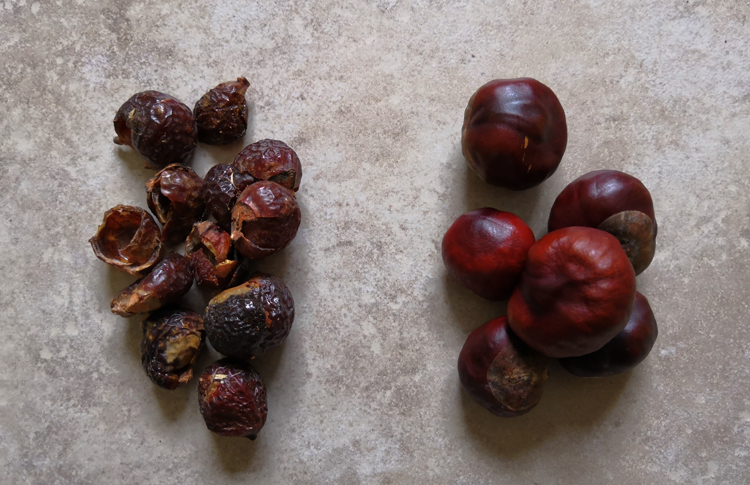 If you’re not familiar with soapnuts I might write a “guide to soapnuts” post, but for today I’m going to focus on Conkers. Before I started writing this post I was thinking how long it’s been since I used a normal washing powder, and I think it’s been around four years. I’ve been using soapnuts for a long, long time, and I’m pretty confident that I know most of the pros and cons of using them. But now that I use conkers for washing instead I can quite confidently say that I prefer conkers by a country mile. They wash so much better. 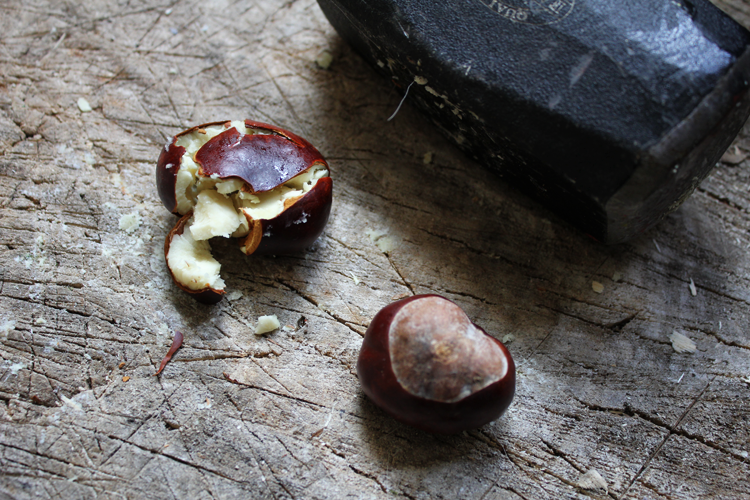 Don’t get me wrong, soap nuts do wash your clothes, but I haven’t found them to be as effective as conkers. Anything which requires more gentle handling (silk, cashmere etc) I’ll wash with the small batch of soapnut I have left. But if you have some truly dirty, sweaty, filth-covered clothes, conkers are much better. 2. I can get them locally. This is huge for me. Anything I can collect myself, especially if it’s a wasted resource, then I’ll happily use them. 3. Whites come out whiter. I guess this would also be a drawback for some people as the conkers do bleach very slightly, and if you’re a person who hates washed out black clothes, then maybe conkers aren’t for you. But as someone who uses cloth nappies for my little one, anything which helps keep them stain free is a plus to me. 4. The clothes smell better. With soap nuts you have to be very careful to let them dry out between washes. Since you can re-use the nuts a few time – about 3 to 4 times – you have to let them dry out or you will start to get this stale, almost moldy smell to your clothes. Conkers are only one use per batch (or per day) so I don’t have this problem. How long can you keep them? I’ve only used them for 3 months now, but I don’t plan to keep them longer than a year. By next autum it’ll be time to collect a new bundle of conkers. Can you add a fragrance to them? Yes, I normally add several drops of essential oils. First ten drops of tea tree oil to each new dried tray of conkers, before they go into my laundry tin for storage, and then four to five drops of my preferred scent with each jug of laundry. My favorite oils to add are; tea tree, lavender, pine or lemon. How well do they work with stains? Very well! So far I’ve tested them out on blood, grass and mud stains and it worked beautifully. 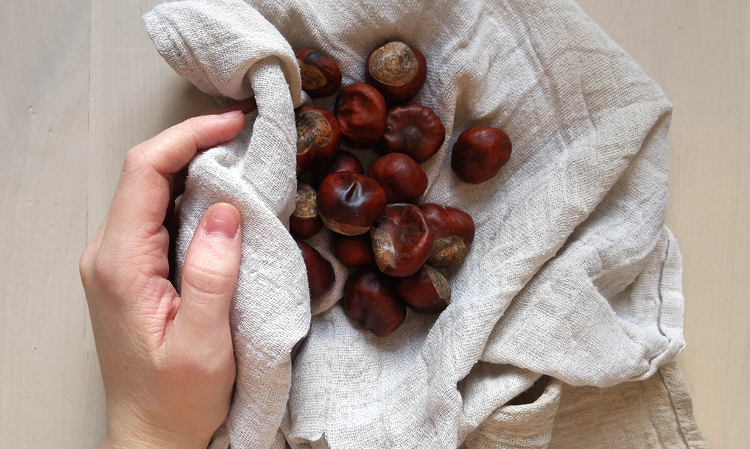 The only time I’ve had trouble was with some dried blood stains, and I deliberately let the blood dry and sit overnight on the kitchen towel so that I could do a test and see how effective the conkers were. I found that when I let the towel sit in Conker juice for ten to fifteen minutes I could lightly rub the blood stains and they disappeared! Then all I did was throw the towel into the next wash and the stains were gone by the time the wash was finished. For tough stains, I would suggest leaving the clothes/items to soak in a small bowl of conker liquid before putting them in the wash. This isn’t always necessary, but I’m yet to have a stain stick around after a wash while using this method. If I can’t be bothered to do that I just rub a fabric soap or vanish bar over the stain before I put it in the washing basket. That way I don’t have to remember to leave it to soak later. How well do they deal with odors? Normal odors? Not a problem. The same goes for the cloth nappies I use for baby, they smell of nothing by the time the wash is finished with them. The only exception that is heavy, heavy perspiration. The kind you’d get if you’ve been doing an intense two-hour gym session. That smell is a little tricker to get out I’ve found, but even a vanish bar hasn’t managed to get those out. The only thing I’ve found does to trick is letting them sit in distilled vinegar to remover the sweat smell. Is this a complete replacement of having to use clothes detergent? For me, yes. I’m used to running a cleaning bar over stains before I pop them in the dirty washing basket and to having the occasional vinegar soak for gym clothes when needed. But if you’re the kind of person who wants to be able to grab a tablet from the draw, throw it into the wash, close the door and be done with it I don’t think you’ll find it to be a complete replacement. How many do you need per load? If you’ve ground your conkers up into crumbs like I did then you only need about a tablespoon, but if you’ve just smashed them into larger pieces then a small handful is needed (which you then need to leave to soak for at least 3 hours). How many do you need to last for the year? Last autumn I collected around two hundred of them, which I’m pretty sure will last me at least until June/july. Ideally next year I want to collect enough to fill up the laundry tin you saw in the video. So about one or two kilos in total, or about 400 conkers. How often do you have to replace the conkers? If I’m doing two washes in one day I’ll reuse the same conkers I used for the first batch. I often find that the second batch is always a lot more frothy and bubbly than the first, but I never reuse them otherwise. If it’s a different day then I use a new load of conkers and throw the old one into the compost bin. What temperature can you wash with them? My washing machine has different heat settings from 30°C to 95°C. So far I’ve found they work slightly better at a higher heat, but they seem to work well regardless. 2018 has been an awful year, and at the same time, one of the best. My little (huge) potato arrived after a very, very rough pregnancy, Corazon and I bought our first home, and we’re finally starting the simple, self-sufficient life we’ve been dreaming of. It’s not a farm or a particularly large piece of land, but it’s enough to do a lot of what we want. With spring and summer coming up next I guess the focus should be the garden, but honestly, I can’t wait till we can get the bathroom fixed and our broken boiler replaced so that I can have a nice (hot) shower again. Washing with jugs is a royal pain in the backside, especially for with long hair. I’m actually dreaming about my new, easy-to-clean, properly water-proofed wet-room shower. My parents had chickens in their garden for quite a few years, and and the difference between the eggs those chickens laid and the shop-bought eggs was astronomical. The perfect example to illustrate the difference is that my brother, who is severely allergic to shop bought eggs, was suddenly able to eat eggs. We all noticed the difference in how they tasted and we felt, and since then I’ve looked forward to the day I could keep my own birds. I’ll write more at some point about why I’m hoping to keep quail and not chickens, but that’s a blog post for another day. I’ve already started this one by growing coriander, basil and parsley on the windowsill, but come summer I’ll be moving most of them – not the parsley- to the garden where they’ll live permanently. I’m going to include garlic and onions to the herb garden too, along with rosemary and a lavender bush. This will be one of the last projects we get done in the garden next year, but once it’s done, it’s done. The plan is to plant two different varieties of apple; one a cooking apple and one a cider apple. Once they’re down it’ll be a waiting game – around 3 or four years – but since the time will pass anyway at some point we will have a reliable supply of dehydrated apples, cider and vinegar to keep us going each winter. I can’t wait! The pregnancy was rough, the post-partum recovery is still ongoing after five months, but bit by bit, my energy is coming back and I’m at a place where I can film again. Here’s to hoping this year is a bit more productive on YouTube. Over the last year we’ve been making lists of the kind of food we eat regularly, and mushrooms – along with onions and eggs – are some of our most eaten foods. If we can grow them it’ll cut down on costs, plastic, and we’ll have fresh homegrown mushrooms. It’ll be another notch in our self-suficient aspirations. 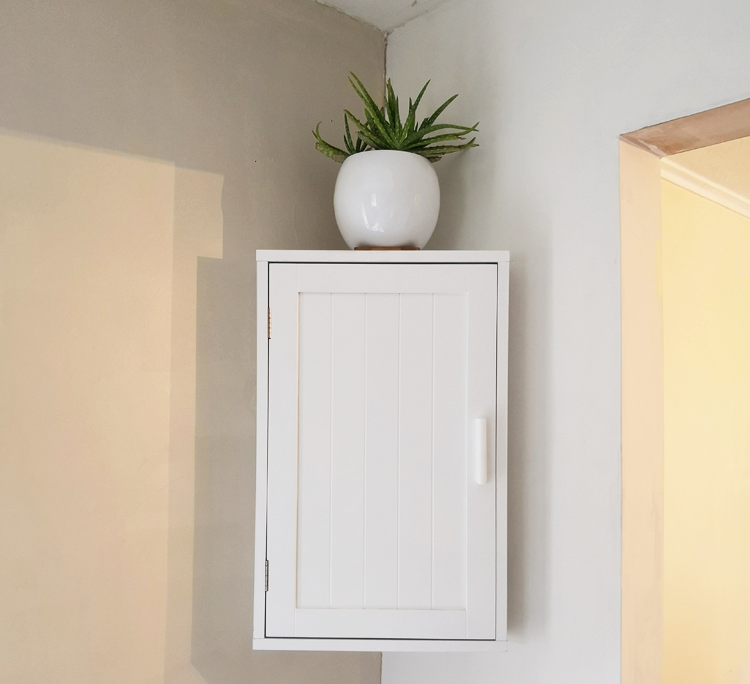 It’s going to take me a while to do this, but once I have the spare funds I plan to completely redesign the kitchen cupboard. To be honest it’s not the worst. It’s actually pretty good in a very basic kind of way. But after you’ve gone through three years of a graphic design degree you can’t help but look at everything and think how can I make that better, cleaner and more efficient. Specifically, more plants that clean the air. England, in general, is a pretty damp place. Where we live it’s especially damp, and every day is a constant battle against mold. Doesn’t help that I’m pretty allergic to mold too. So any plants which are going to help me on that battlefront and help keep the air cleaner is a serious win. I have so, so many things I need to make. Doorway curtains to keep the drafts out, clothes to fix, buckwheat pillows to make, nappy liners…the list is endless and it’s a skill I really want to learn. It’ll be rough and probably the kind of thing that’ll make my sister want to cry, but it’ll work. This has been a goal I’ve been working on for the last two, now pushing three years. When I started to read “The Life-Changing Magic of Tyding” it flicked a switch on in my brain that helped me tackle my surrounding habitat like a bulldozer. And it’s been an absolute Godsend for my mental health, wallet, and life in general. 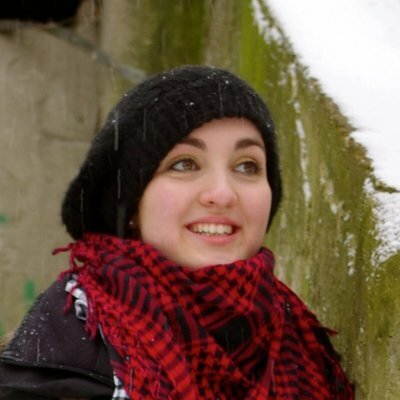 It helped me start to figure out what were triggers for irrational purchases, impulse purchases and generally direct my wallet and energy towards the kind of life I wanted. My kitchen now has about one third of the utensils and items that it used to have, but I cook more and – I like to think – better. My wardrobe is one fourth of the size, and steadily shrinking, but it no longer makes me anxious to look at and organize. We have far less furniture, fewer books, heck, even less studio equipment and even art supplies! But I’m getting more use, less stress and a lot more joy out of being around them. It’s still a process, five years, even ten years from now it’ll still be a process, but it’s a process I really enjoy. Part of that is because it’s allowed me to design my surroundings. Take the aforementioned kitchen cupboard for example. Now that I’m very aware of what comes into the house, what we eat and like I want to make sure that I can see and use that food. If I can’t see it I forget to use it, the food goes off, creating clutter and waste. Two things I really, really hate. So, here’s to a new year, new goals and the start of our new life. Let’s see how it goes!